Injury-hit Hednesford Town slumped to their second defeat in succession after losing out 2-1 to Solihull Moors at Keys Park. This performance somewhat dented The Pitman’s hopes of lifting the Skrill North title as Rob Smith’s side slipped down to third place in the table, some three points off top spot, writes Scott Smith. 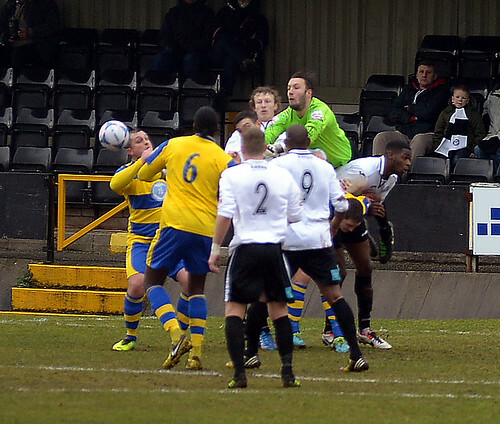 With the game being one of only a handful to survive the bad weather throughout the division, Hednesford started the better of the two sides and in the fifth minute first Nathan Blissett saw a shot turned away before Paul Sullivan’s follow up effort was superbly saved by Jasbir Singh in the Moors goal. A minute later the whole of Keys Park was united as one to show their support to popular midfielder Kris Taylor who had recently been diagnosed with testicular cancer, whilst Taylor was able to witness the fans’ appreciative support for himself, with him attending his first match following his recent operation. Despite the lively start there was little else of note really to report in the first half. Hednesford goalkeeper Dan Crane was forced into having to come to claim two free kicks inside his box, whilst right on the stroke of half-time Town’s Robbie Thompson-Brown saw his cross tipped behind for a corner. 12 minutes into the second period Solihull would edge ahead in controversial circumstances. Ben Bailey was adjudged to have stopped the ball with his hand some 20 yards from goal, much to the dismay of the defender who showed the mark on the chest of his shirt to the officials. However the decision stood and Dior Angus’ resulting free kick drifted into the bottom corner of the net with no-one seemingly getting a touch. Despite this goal momentum swung back Town’s way when pantomime villain Gary Birch was dismissed for kicking out at Paul McCone right in front of the referee. The Pitmen now threw everything at the visitors with another striker in Charlie Anagho-Ntamark being added to the ranks, and it almost got them the equaliser in the 75th minute. Fellow substitute Alex Melbourne got to the by-line and his low cross was deflected goalwards by a Moors defender but just stopped in time on the line by Singh. Hednesford continued to knock at the Solihull door and in the 77th minute they drew level when the ball was laid back to Anagho-Ntamark who blasted home from just inside the box for his first ever senior goal. Town now pushed forward in search of a second, however it would arrive at the other end when a ball into the box wasn’t cleared and it fell to Junior English who swept home from 20 yards in the 81st minute. The afternoon would go from bad to worse for the hosts with Town captain Darren Campion being dismissed three minutes later for a second bookable offence to end a miserable day for The Pitmen. Hednesford now have another week’s grace from action before hosting Histon at Keys Park on Saturday 22nd February, 3pm kick off.